EmilyChang.com, launched in September 2005, has now reached a combined RSS feed total of over 25,000 daily readers. To grab your own feeds from this site, please visit the subscribe page. EmilyChang.com, launched less than a year ago, has now reached a combined RSS feed total of over 10,000 daily readers. To grab your own feeds from this site, please visit the subscribe page. 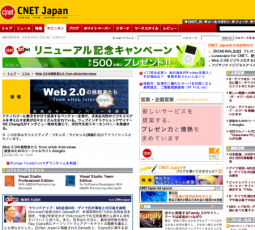 Today, Emily Chang’s eHub Interviews went live as a channel at the Japanese version of News.com. See Emily’s blog post. Emily Chang’s eHub is listed in the Top 100 Feeds at Dave Winer’s Share Your OPML, a “commons for sharing outlines, feeds, and taxonomy” (currently #59). Thanks to Catherine (cat) Morley, creator of Designers Who Blog, for featuring EmilyChang.com and eHub! Read Cat’s entry about eHub here.